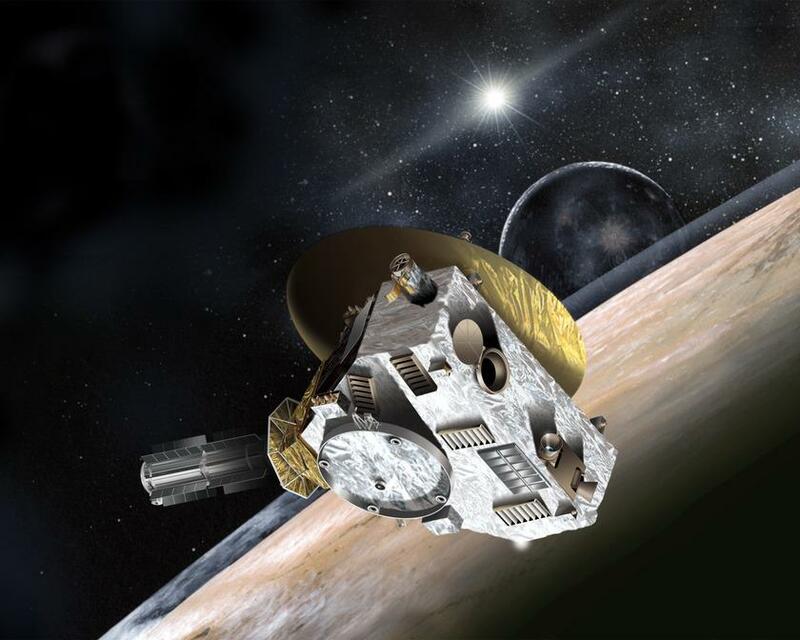 A LASP-led and University of Colorado Boulder student-built instrument riding on NASA’s New Horizons spacecraft found only a handful of dust grains, the building blocks of planets, when it whipped by Pluto at 31,000 miles per hour last July. Data downloaded and analyzed by the New Horizons team indicated the space environment around Pluto and its moons contained only about six dust particles per cubic mile, said LASP planetary scientist and CU-Boulder Professor Fran Bagenal, who leads the New Horizons Particles and Plasma Team. Studying the microscopic dust grains can give researchers clues about how the solar system was formed billions of years ago and how it works today, providing information on planets, moons, and comets, said Bagenal. A paper on Pluto’s interaction with the space environment was published in the journal Science on March 18. The study was led by Bagenal and involved more than 20 other researchers, including LASP research scientist Mihály Horányi; CU-Boulder doctoral student Marcus Piquette of the Department of Astrophysical and Planetary Sciences; and Southwest Research Institute (SwRI) postdoctoral researcher Jamey Szalay, who received his doctorate in physics from CU-Boulder under Horanyi last year. 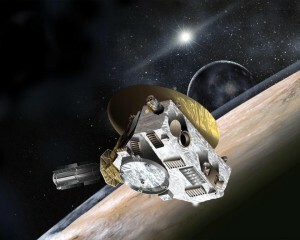 Launched in 2006, the New Horizons mission was designed to help planetary scientists better understand the icy worlds at the edge of our solar system, including Pluto and Kuiper Belt objects. A vast region thought to span more than a billion miles beyond Neptune’s orbit, the Kuiper Belt is believed to harbor at least 70,000 objects more than 60 miles in diameter and contain samples of ancient material created during the solar system’s violent formation some 4.5 billion years ago. Horanyi said the Student Dust Counter (SDC) onboard New Horizons logged thousands of dust grain hits over the spacecraft’s nine year, 3 billion-mile journey to Pluto while most of the other six instruments slept. “Now we are now starting to see a slow but steady increase in the impact rate of larger particles, possibly indicating that we already have entered the inner edge of the Kuiper Belt,” said Horanyi, the principal investigator for the SDC. The SDC is a thin film resting on a honeycombed aluminum structure the size of a cake pan mounted on the spacecraft’s exterior. A small electronic box functions as the instrument’s “brain” to assess each individual dust particle that strikes the detector, allowing the students to infer the mass of each particle. A revolving cast of more than 20 CU-Boulder students, primarily undergraduates, worked on designing and building the SDC for New Horizons between 2002 and 2005. Several students and researchers are now assessing data from the flyby. New Horizons is traveling at a mind-blowing 750,000 miles a day. Images from closest approach were taken from roughly 7,700 miles above Pluto’s surface. The spacecraft, about the size of a baby grand piano, carries six other instruments. The principal investigator of the New Horizons mission is Alan Stern of the SwRI Planetary Science Directorate in Boulder, who received his doctorate from CU-Boulder in 1989. “CU-Boulder is the only place in the world where students could have built an instrument that eventually flew off to another planet,” said Bagenal. The next and final target of New Horizons is a 30-mile diameter Kuiper Belt object named 2014 MU69, which the spacecraft is expected to pass in early January 2019. Bagenal is also a mission scientist for NASA’s Juno Mission to Jupiter, which launched in 2011 and will begin orbiting the gas giant’s poles in July. Funding for SDC came primarily through the Johns Hopkins University Applied Physics Laboratory, which manages New Horizons, and SwRI. LASP also has contributed funds to help pay students working on SDC. For more information on SDC, see: http://lasp.colorado.edu/home/sdc.